I couldn’t get over how dark so many of them were. I first saw a small Riverside Retro from the highway and fell in love with them. Unfortunately, they only carried the smaller versions. I found my perfect rig in Seale, Alabama, literally on my way to my first SOTF event, Winding Down at Wind Creek 2017, where I had reserved a hotel room since I didn’t own an RV. This beautiful TURQUOISE 529RL fit all my desires. A great living space to work and edit my photographs, a walk around space in the bedroom, lots of storage, and so stinking cute! Sea Gypsy’s name reflects my deep love of the ocean and my nomadic “gypsy” traveling love. As an underwater photographer and travel writer, I needed something that would offer storage for my scuba gear and photography equipment, as well as storage for multi seasonal clothing. The theme goes along with my most “happy place”, being underwater. I have seahorse decals on the back, lots of mermaid figures/octopi/turtles/seahorse decor, inspiring quotes about the sea and traveling, and lots of turquoise, which makes me feel I am underwater. Oh the adventures Harley (my spunky cairn terrier) and I have had with Sea Gypsy. We get so many people who comment on her retro look and ask if it is restored or new. We have been to Key Largo, Fl and back, staying in National and State Parks, as well as lots of private RV parks in the winter/spring of 2018. After several short stays to practice being a brand new single RV-er, I ventured to a SOTF event in Moab, Utah for March 2018. We made stops in Huntsville, Al, Little Rock, AK, OK, Albuquerque, NM, Cortez, CO, Winslow, Az, Lake Powell, Az, Zion National Park and more! We had weather from lovely mid- 70’s to freezing low teens. The Rockin’ the Red Rocks event was simply incredible. I met up with some SOTF sisters along the way and visited so many cool places I would never have ventured to see otherwise. I dove on a freezing day in the Blue Hole in Santa Rosa, NM. I spent 3-1/2 months diving almost daily in Key Largo, FL this summer, photographing hammerhead sharks, turtles and more. I have dents on the front from the tailgate hitting the RV due to the hitch being too high, from my kayak (in bed of truck) pushing against it with too much of a 90 degree angle. My bike handles broke out a truck window during a torrential rain storm. I strongly recommend connecting with other RVers on social media. 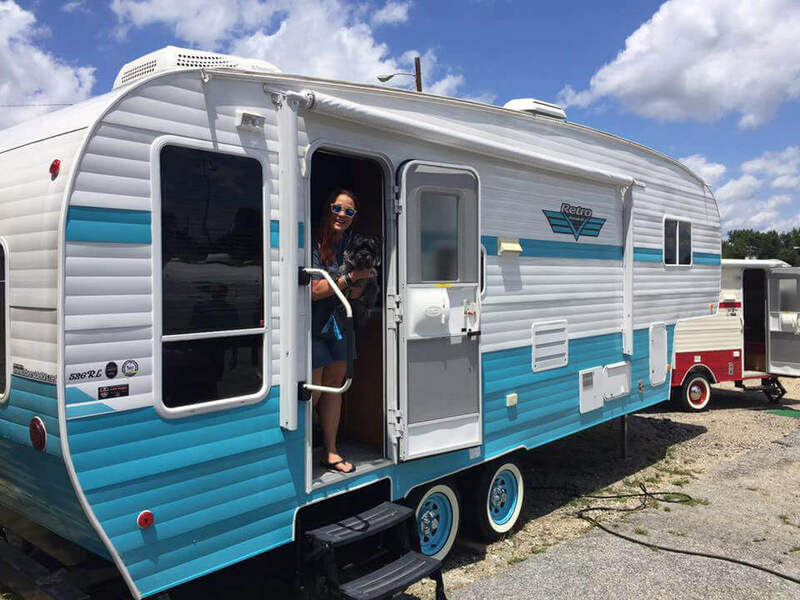 I have learned so much from several group on Facebook such as: Women Who RV, RV Tips, RV Newbies, Gypsy Travelers, Girl Camper Podcast, Traveling Solo RV & Camping, Fabulous RV Women, 50 & Over RVers, Riverside Whitewater Retro Travel Trailers, and more. Through it all, I wouldn’t trade a single dent, stressed back in, or memory I have made in my amazing Sea Gypsy! I have conquered fears of traveling alone, I have been to over 60 different RV parks, and met some of the most amazing people. I am planning a trip up the East Coast formal colors in the Fall 2018, then back to the Keys for Dec-March 2019. I can’t wait for several SOTF events this fall and next year! If I can do it, anybody can do it! Go Girl Power!! !